It has come to our attention that you are planning to play a chess match for a cash prize in the Federal Republic of Yugoslavia (Serbia and Montenegro) (hereinafter "Yugoslavia") against Boris Spassky on or about September 1, 1992. As a U.S. citizen, you are subject to the prohibitions under Executive Order 12810, dated June 5, 1992, imposing sanctions against Serbia and Montenegro. The United States Department of the Treasury, Office of Foreign Assets Control ("FAC"), is charged with enforcement of the Executive Order. The Executive Order prohibits U.S. persons from performing any contract in support of a commercial project in Yugoslavia, as well as from exporting services to Yugoslavia. The purpose of this letter is to inform you that the performance of your agreement with a corporate sponsor in Yugoslavia to play chess is deemed to be in support of that sponsor's commercial activity. Any transactions engaged in for this purpose are outside the scope of General License No. 6, which authorizes only transactions to travel, not to business or commercial activities. In addition, we consider your presence in Yugoslavia for this purpose to be an exportation of services to Yugoslavia in the sense that the Yugoslav sponsor is benefitting from the use of your name and reputation. Violations of the Executive Order are punishable by civil penalties not to exceed $10,000 per violation, and by criminal penalties not to exceed $250,000 per individual, 10 years in prison, or both. You are hereby directed to refrain from engaging in any of the activities described above. You are further requested to file a report with this office with 10 business days of your receipt of this letter, outlining the facts and circumstances surrounding any and all transactions relating to your scheduled chess match in Yugoslavia against Boris Spassky. The report should be addressed to: The U.S. Department of the Treasury, Office of Foreign Assets Control, Enforcement Division, 1500 Pennsylvania Avenue, N.W., Annex - 2nd floor, Washington D.C. 20220. If you have any questions regarding this matter, please contact Merete M. Evans at (202) 622-2430. Charles P. Pashayan, Jr., Esq. The above letter may be viewed in adobe PDF format on Bobby Ang's home page. 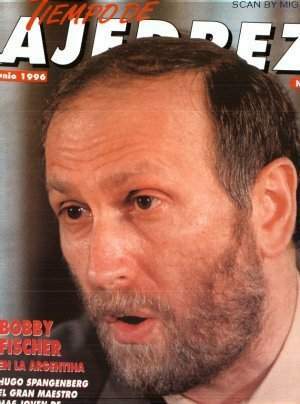 After 27 years of giving almost no interviews with the press, Bobby Fischer has been interviewed on the radio three times. Here are two of those interviews! Here is a link: Bobby Fischer: International Fugitive From Justice.